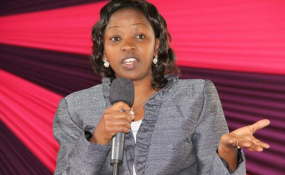 Deputy President William Ruto’s wife, Rachel Ruto. An attempt by State House Secretary of Digital Communication Dennis Itumbi to make the wife DP William Ruto, Rachael Ruto, look good boomeranged on Wednesday afternoon after he was caught lying using old pictures. Mr Itumbi had tweeted pictures of Mrs Ruto next to a caravan full of foodstuffs and other supplies purportedly in the drought-hit Turkana and Baringo counties. Two other images showed Mrs Ruto sharing the goodies with some officials. The pictures, which were posted at 3:40pm, were captioned: "A donation by @MamaRachelRuto in aid of fellow Kenyans facing hunger in Turkana and Baringo drought." Mr Itumbi, however, later deleted the post after people questioned why Mrs Ruto had opted to donate detergent to people in dire need of food. He did not offer an explanation or an apology. It has now emerged that the pictures were actually taken from a trip the DP's wife had made in April 2014. This was confirmed by the DP's spokesman David Mugonyi, in an interview with P Live. "Mugonyi also added that Mrs Ruto had not visited Turkana on Wednesday for food donations," reported the website.